Home of Grandma's Poetry Book & "Should I Wear Floral ?" This book tells it just as it is for so many of us Grandma's, great humour. Well done Di, I enjoyed and will enjoy dipping into it in the future. Delightful little book of poems and illustrations, which are wonderfully warm and gentle. I will enjoy dipping into it in the future. ‘Read and Enjoy’ What a lovely book...lots of wisdom and personal input. Every Grandmother will appreciate the sentiments; the see-saw from laughter to tears and back again.This is real writing from life, don't miss it - perhaps we will see a novel 'ere long?I await the next book from this author with bated breath! Di Castle has written a lovely book charting her journey as a Grandmother. 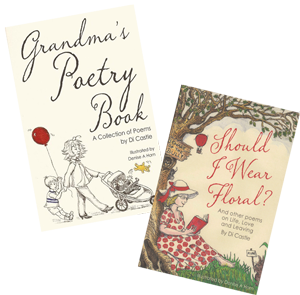 Called Grandma's Poetry Book it is a gentle, whimsical and sometimes downright moving collection of poems with more than a hint of AA Milne in the rhythms... The illustrations remind me of my favourite children’s picture books. Recommended for the new grandparents in your social circle. Hello Di, I am emailing to thank you and Denise for inscribing 'Grandma's Poetry Book' My mother bought the book from you at the antiques fair at Osmington whilst selling her antiques. 'Grandma's Poetry Book' just arrived to me here in Alberta, Canada and though it's a late Christmas present, it's a real treat. I enjoy one poem a day. Loving the way your words and rhyme flow too and illustrations are truly wonderful, something I wish I had thought more about before I published my first poetry book 'Moments In Mind' back in 2008. Denise Horn is very talented indeed. - Katie. This is a beautiful book bought for me as a Christmas gift. I read the whole thing in one sitting and could relate to all of it. This would make a great gift for any grandma or grandma-to-be. For Di Castle, her role as grandma is certainly special, and she has put many of her experiences, thoughts and feelings into a delightful book, Grandma’s Poetry Book, full of touching and often witty little poems, with charming illustrations by Denise Horn..."
"This lovely book is cleverly written by Di Castle and illustrated by Denise A Horn. It is filled with completely delightful poems cataloguing the journey from birth onward of Grandchildren in the eyes of their Grandma. The poems are witty, accurate and sometimes quite emotive. It starts with life before Grandchildren, the birth and illustrates all the ups and downs and the amazing relationship between Grandparent and Grandchild. The illustrations match the tone and humour of the poetry and completely bring to life the imagery in your head as you read along..."
"Now here is a book that will pull at your heartstrings. Prepare to be tearful yet full of smiles and nodding in agreement throughout..."
"When I received the book it in the post I had a quick flick through, giggled and then gave it to my Mum to read at her leisure. It took her forever to pick it up because she wanted to finish the book she was reading but once she started it she couldn’t put it down. After I had a chance to read the poems as and when I could we sat down to discuss what we thought of it and agreed that it really was a lovely book of Poetry which enjoyably read almost like a story. I really enjoyed being part of the Authors witty and heartfelt journey and love that she lives in Dorset and mentions some of our favourite little haunts like Farmer Palmers and Monkey World." Grandma’s Poetry Book and Should I Wear Floral ? are from Di Castle's poetry collection. Should I Wear Floral ? Di’s latest book Should I Wear Floral ? takes a humorous peek at life, love and leaving over the last twenty-five years. The poems stem from observations, eavesdropping and experience while several originated with news stories and memorable events such as the deaths of Princess Diana, the Queen Mother and Spike Milligan. Learn about the 'Look Down Generation', the 'Boomerang Generation' and those annoying people who are Always There. The poems open a window on many familiar situations everyone will recognise. They include references to current social issues such as mobile phones, cruising crowds, choirs, retirement, shopping madness, credit cards, answerphones. There are two parodies on Gilbert and Sullivan songs. The section on Leaving, far from being morbid (yes I did have one would-be buyer quickly put the book down!) celebrates Marmalade the cat’s life and the poem Hers and His is a humorous look at the inanity of separation and divorce. AIso included in ‘Floral’ is a collection of poems with a Swanage theme to celebrate the home town of both author and illustrator, Denise Horn. Both Di’s books are available at The Swanage Bookshop, Station Road, Swanage, The Old Stables, Swanage, Dorset bookshops such as The Bridport Bookshop and Winstone’s in Sherborne. If you are in Hayling Island, the Hayling Island Bookshop has a copy. It is also stocked and sold successfully in emporiums such as Wardon Hill Trading Post (Yeovil Road) and Quayside Emporium, Poole Quay. Books can be ordered (signed) via Facebook Di Castle or Di Castle – Writer or via her website www.dicastle.co.uk. All books bought via the website come signed by the author, please contact me if you would like a special signed message. Price includes first class postage to UK, please contact me for shipping prices outside of UK. Roderick Grant, author of Clap Hands For the Singing Molecatcher and Stathalder.